This week CNBC celebrated their 25th anniversary on the air. 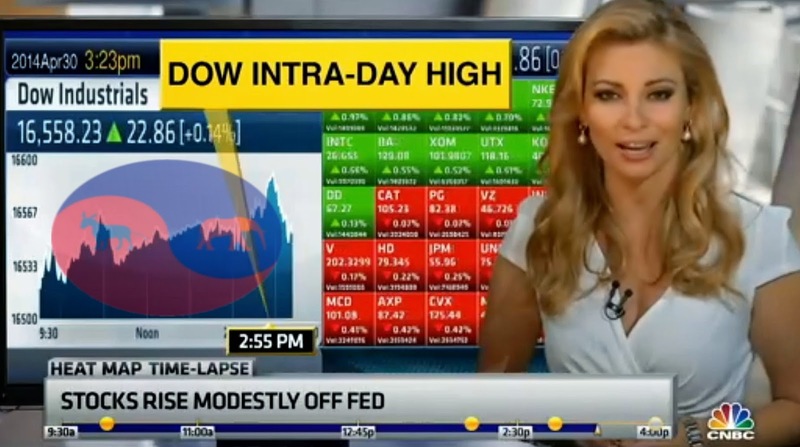 The Dividist finds a higher signal to noise ratio at CNBC than most cable news networks, so it has often served as a primary source on this blog. We would be remiss if we let CNBC's 25th anniversary pass without taking note and highlighting a few of the Dividist Paper's Greatest CNBC hits. That was over seven years ago when this blog was in its infancy. We've had divided government in all but two years since. The market preference for divided government was again highlighted on the Kudlow Report shortly before the 2010 midterms as his panel anticipated a Republican wave that would sweep away that short two year interval of Democratic One Party Rule. Last month, In the final episode of Kudlow's show, divided government was again a topic of conversation, although the tenor was a bit more reticent. Kudlow: "Robert Costa politically, do you see any major policy changes? -- let's start with this year." Costa: "No I don't. I think when you look at what house Republicans are doing they've started to acknowledge a divided government is not going to yield any major conservative gains. So they're mostly playing defense and they're trying to move their message and agenda away from the shutdown politics of the fall. When I interviewed Eric Cantor recently he was talking about the so-called middle-class squeeze. He was talking about jobs but he wasn't really articulating a broad, vigorous growth message. You see some talk about Obamacare. but it's really a small ball agenda. I think they're just trying to play it safe ahead of the midterms. And the Democrats - you guys are right - the President's focused on regulations. He's focused on his pen. He doesn't think he can get anything done with this divided Congress. so I think we're going to see some very incremental political bills the rest of the year." He says that like it's a bad thing. Panelist Bob Costa seems to regret that the Republicans were unable to implement a big conservative agenda due to the restraints imposed by a divided Congress. 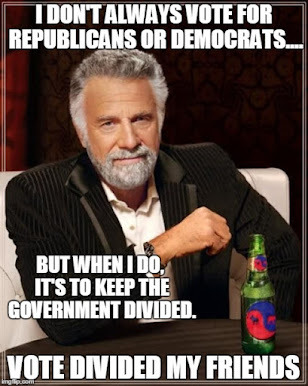 Of course, for a dividist like your loyal blogger, restraining the worst impulses of both parties is exactly the point and a reason to vote for divided government. 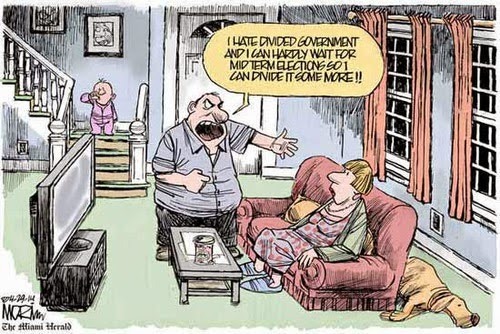 Although we've frequently tapped the topic "Investors Love Divided Government", we need to come clean. "Over the long or medium term, we do not think any attempt to correlate political parties in power and stock market performance should be taken more seriously than the Hemline Index or the Super Bowl Indicator. The reason is simple. The federal government does not and can not control GDP, private employment, corporate profits, and/or the stock market as much as congress, presidents or presidential wannabes would like us to believe. Studies that look for correlation between parties in power and those things that the federal government does directly control (spending, deficits, legislation, armed conflict, and currency) are interesting and informative. For that we can look to political scientists and economists like Niskanen, Van Doren, Mayhew, and Slivinski for answers. But lasting effects on the stock market based on party in power? No." If you’re waiting for an election all-clear, in our view, it’s a fool’s errand. Markets are forward-looking, and they’re likely already well aware of the election’s probable outcome. Chances are they’ll start digesting the likelihood of gridlock before the votes are tallied." "In fact, the best government for the economy is a Democratic president and a Republican Congress, which is roughly what we have right now. The next best is a Republican president and Democrat Congress.The important thing for the economy is that government be divided so that it gets little done. Having the two parties restraining and blocking each other helps businesses because the politicians pass fewer laws and thus do less damage to the economy." We report, you decide. With that, we'll wrap this up. Congrats CNBC, keep up the good work and keep pushing up those blog stats.